Alpine or maritime region ? Over the millennia, the Mercantour, a border zone with complex topography, has constantly been submerged by the currents of history, raging between the Alpine summits and the Mediterranean coast. A geopolitical panorama of an eventful area that is still attempting to forge a strong identity. In 1794 in London, Albanis Beaumont published a handsome, illustrated work titled Travels through the Maritime Alps. 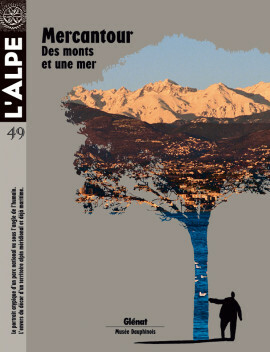 The book, the result of several walking trips by the Savoy architect, presented a journey through the maritime Alps from Italy to Lyon, via the Col de Tende, Nice, Provence and Languedoc. Dedicated to the Duchess of Gloucester, the text has never been translated. Excerpt from the chapter titled Starting from Tende. The Mercantour park, the most recent of the national parks in continental France, owes its existence at least in part and paradoxically to the royal hunting reserve that formerly covered most of its territory. An unusual set of legal, historic and diplomatic circumstances resulted in its creation in an area virtually free of any major development. Over the past 30 years, the Mercantour park has survived many adventures. Long contested, even violently, and overly inward looking, it must now launch its transition to more open contacts and better relations with local stakeholders. What human landscape is masked by this territory often celebrated for its natural magnificence, but which is also, or perhaps above all, so very appealing to the senses ? To discover it, Caroline Audibert patiently walked its many paths to meet the local people, slowly putting together a highly nuanced portrait of a region that even today still hesitates between the past and the future. The Mercantour park owes its identity to the diversity of its landscapes, but also to the perceptions of the men and women who live there or visit it. A recent change in the law has produced a small revolution in that it provides the population with the opportunity to familiarise itself with and thus better develop the territory. A new institutional context presented by a geographer and illustrated here with portraits of local stakeholders from the field. In a high valley of the Mercantour park, the rocks speak. A dreamlike and mysterious place, the Merveilles valley offers its flat stone surfaces to anyone passing through and people have seized the opportunity for the past 5 000 years. Shepherds in particular have engraved hundreds of messages. A mythical site, but very fragile. An open book now threatened by its reputation. Michel Graniou is one of those rare artists capable of devoting equal attention to the delicate work on his magnificent images and to unexpected subjects. His work oscillates between touching modesty toward handmade objects and the profound intimacy of a photographer addressing the Mercantour landscapes. A troubling juxtaposition. All the best addresses to discover the heart and soul of the Mercantour national park, via the paths, inns, landscapes and museums. The park has taken on the gigantic task of drawing up an inventory of biodiversity in the Mercantour range. The list of all fauna and flora, the largest in Europe, will identify thousands of species including many discreet lichen and insects. A lively and colourful microcosm that may reveal life forms as yet unknown to science. An inquiry with a magnifying glass in hand. Valuing and promoting the cultural heritage is a new mission assigned to national parks that were, until now, strictly focussed on environmental protection. The mission raises a number of fundamental questions. Among the many traces left by humans over the millennia on the so-called « natural » landscapes of the Mercantour park, which should be protected and how ? The park is 30 years old. What now ? And in 30 years ? What will the national park have become ? The current president, Éric Ciotti, presents here the project for a new park charter that will put human activities at the heart of the system. He also mentions entry in the World heritage list promoted by a new, bi-national organisation.